Any host generating traffic within your network should have three identifiers: a MAC address, an IP address, and a hostname. In most cases, alerts for suspicious activity are based on IP addresses. 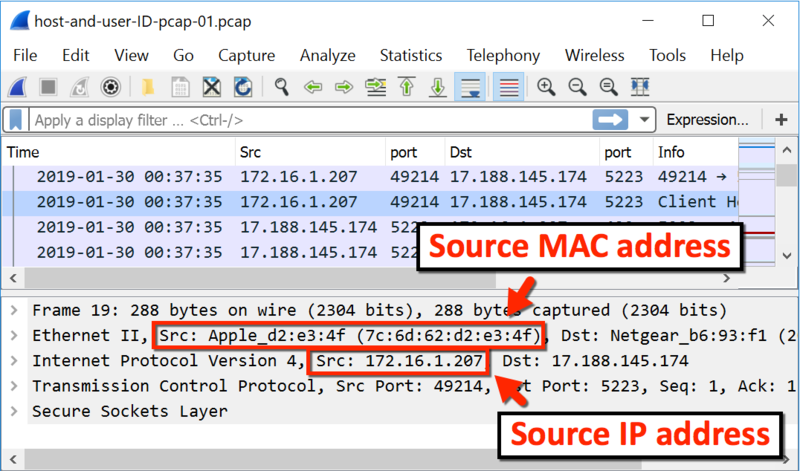 If you have access to full packet capture of your network traffic, a pcap retrieved on an internal IP address should reveal an associated MAC address and hostname. 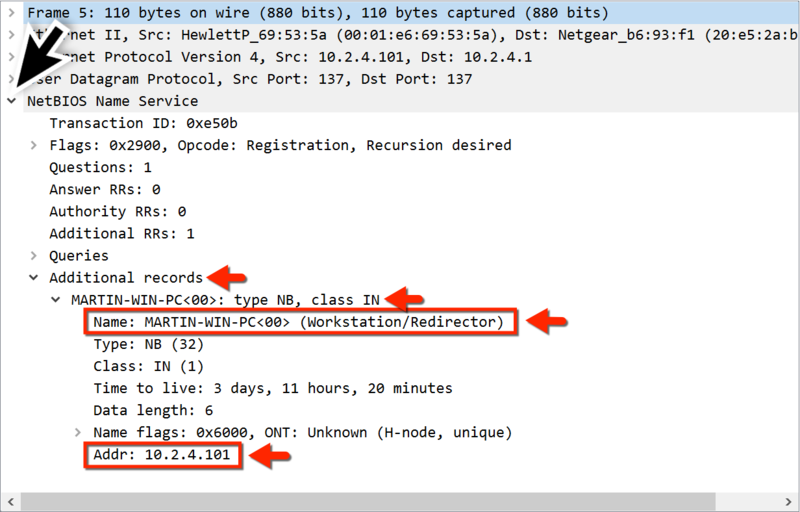 How do we find such host information using Wireshark? We filter on two types of activity: DHCP or NBNS. DHCP traffic can help identify hosts for almost any type of computer connected to your network. NBNS traffic is generated primarily by computers running Microsoft Windows or Apple hosts running MacOS. The first pcap for this tutorial, host-and-user-ID-pcap-01.pcap, is available here. This pcap is for an internal IP address at 172.16.1[.]207. 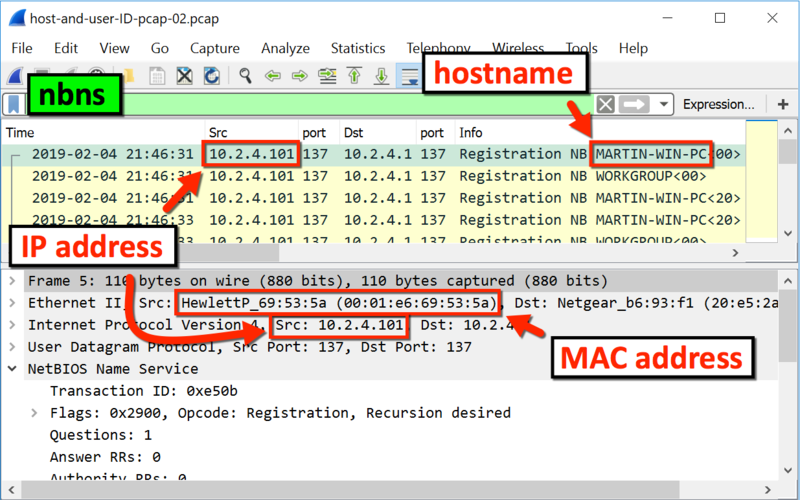 Open the pcap in Wireshark and filter on bootp as shown in Figure 1. This filter should reveal the DHCP traffic. 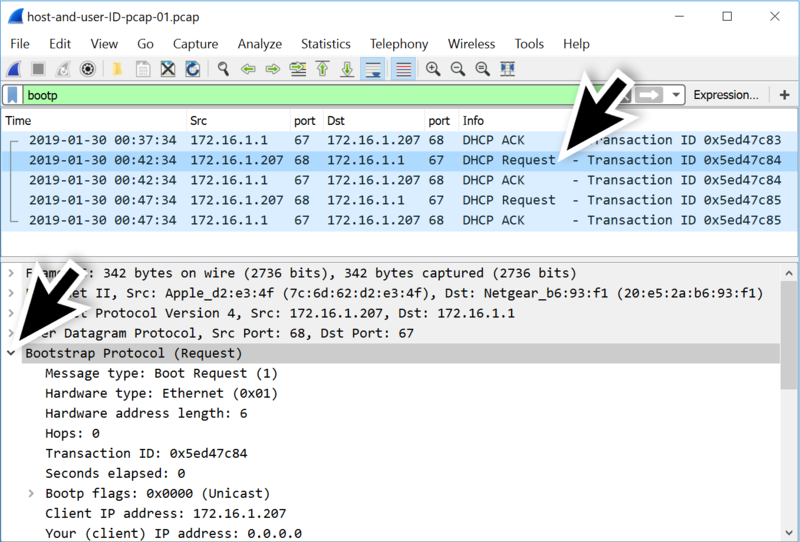 Note: With Wireshark 3.0, you must use the search term dhcp instead of bootp. Select one of the frames that shows DHCP Request in the info column. Go to the frame details section and expand the line for Bootstrap Protocol (Request) as shown in Figure 2. Expand the lines for Client Identifier and Host Name as indicated in Figure 3. Client Identifier details should reveal the MAC address assigned to 172.16.1[. ]207, and Host Name details should reveal a hostname. In this case, the hostname for 172.16.1[. ]207 is Rogers-iPad and the MAC address is 7c:6d:62:d2:e3:4f. This MAC address is assigned to Apple. Based on the hostname, this device is likely an iPad, but we cannot confirm solely on the hostname. We can easily correlate the MAC address and IP address for any frame with 172.16.1[. ]207 as shown in Figure 4. Depending on how frequently a DHCP lease is renewed, you might not have DHCP traffic in your pcap. Fortunately, we can use NBNS traffic to identify hostnames for computers running Microsoft Windows or Apple hosts running MacOS. The second pcap for this tutorial, host-and-user-ID-pcap-02.pcap, is available here. This pcap is from a Windows host using an internal IP address at 10.2.4[.]101. 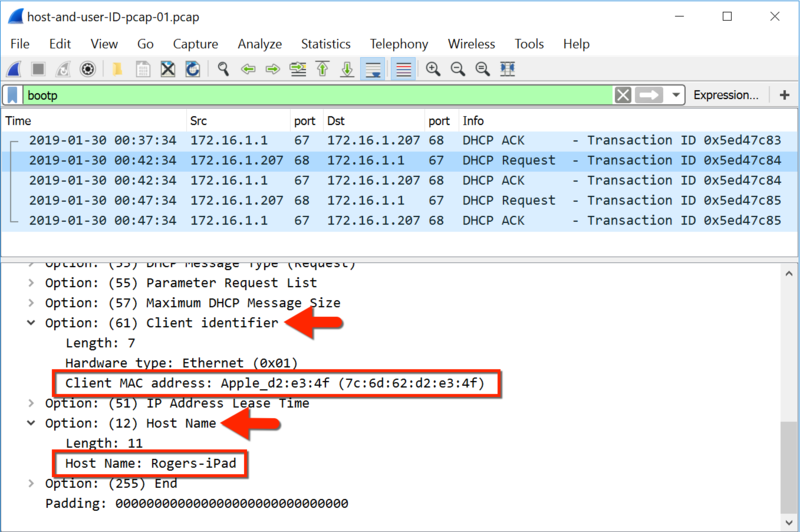 Open the pcap in Wireshark and filter on nbns. This should reveal the NBNS traffic. Select the first frame, and you can quickly correlate the IP address with a MAC address and hostname as shown in Figure 5. The frame details section also shows the hostname assigned to an IP address as shown in Figure 6. User-agent strings from headers in HTTP traffic can reveal the operating system. If the HTTP traffic is from an Android device, you might also determine the manufacturer and model of the device. 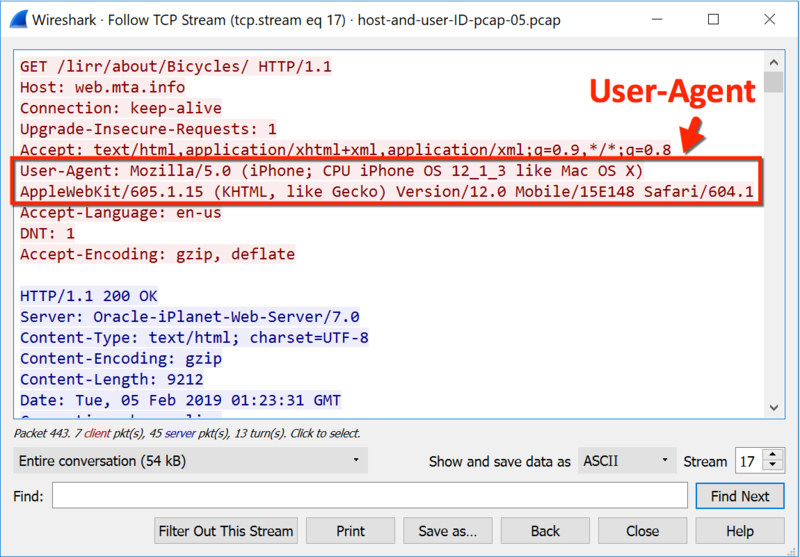 The third pcap for this tutorial, host-and-user-ID-pcap-03.pcap, is available here. This pcap is from a Windows host using an internal IP address at 192.168.1[.]97. 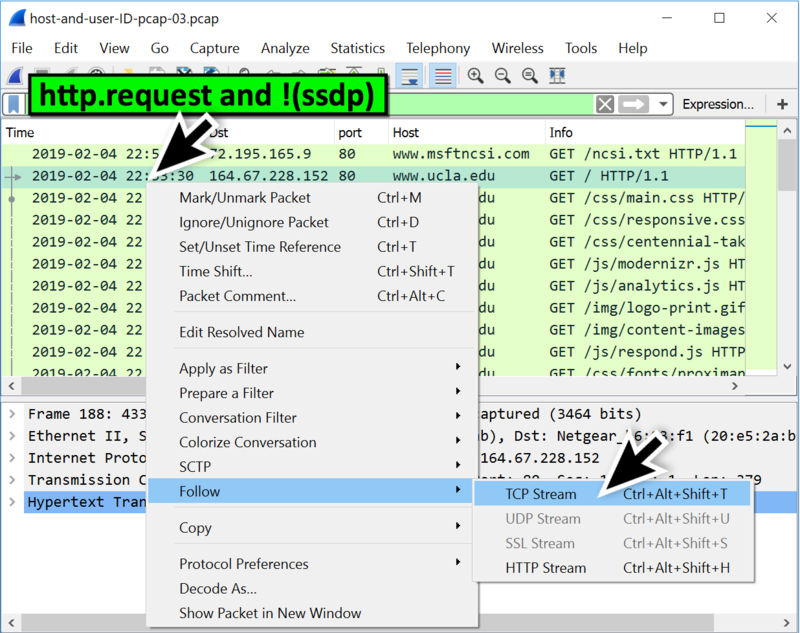 Open the pcap in Wireshark and filter on http.request and !(ssdp). Select the second frame, which is the first HTTP request to www.ucla[. ]edu, and follow the TCP stream as shown in Figure 7. This TCP stream has HTTP request headers as shown in Figure 8. The User-Agent line represents Google Chrome web browser version 72.0.3626[. ]81 running on Microsoft’s Windows 7 x64 operating system. With HTTP-based web browsing traffic from a Windows host, you can determine the operating system and browser. The same type of traffic from Android devices can reveal the brand name and model of the device. The fourth pcap for this tutorial, host-and-user-ID-pcap-04.pcap, is available here. This pcap is from an Android host using an internal IP address at 172.16.4.119. 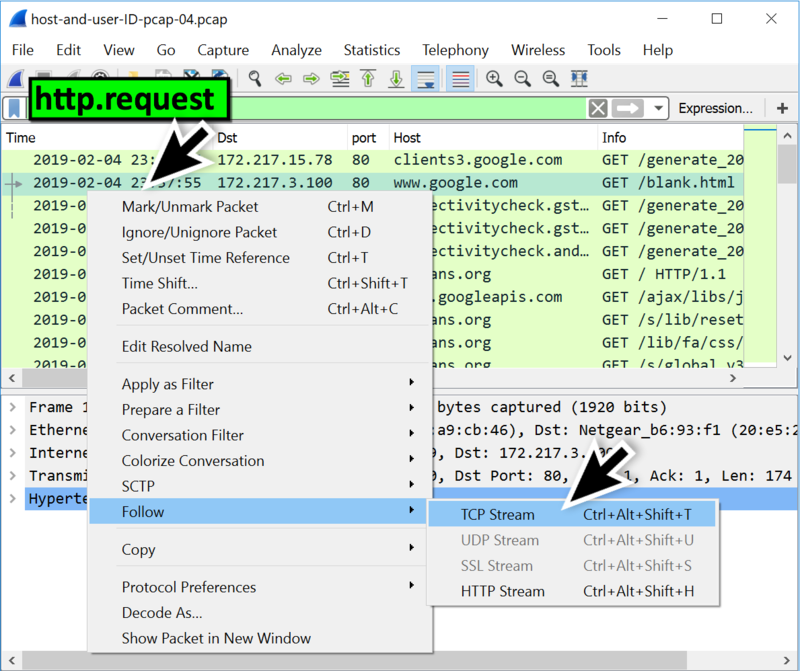 Open the pcap in Wireshark and filter on http.request. Select the second frame, which is the HTTP request to www.google[. ]com for /blank.html. Follow the TCP stream as shown in Figure 9. 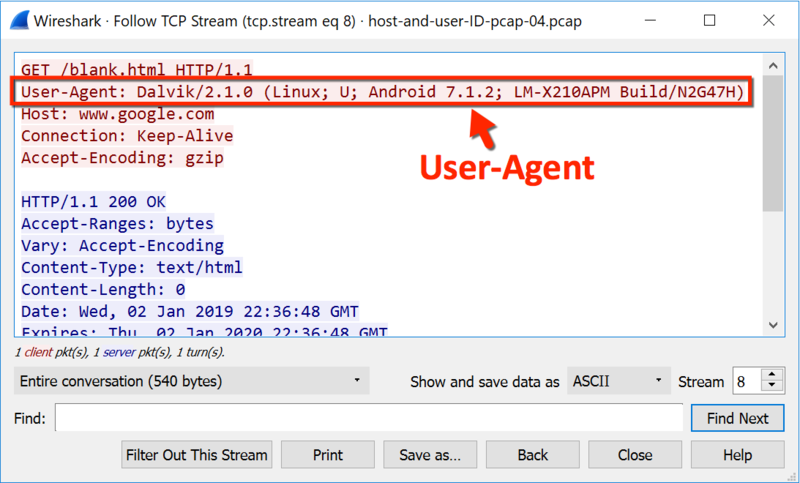 The User-Agent line in Figure 10 shows Android 7.1.2 which is an older version of the Android operating system released in April 2017. LM-X210APM represents a model number for this Android device. A quick Google search reveals this model is an LG Phoenix 4 Android smartphone. The User-Agent line for HTTP traffic from an iPhone or other Apple mobile device will give you the operating system, and it will give you the type of device. However, it will not give you a model. We can only determine if the Apple device is an iPhone, iPad, or iPod. We cannot determine the model. The fifth pcap for this tutorial, host-and-user-ID-pcap-05.pcap, is available here. This pcap is from an iPhone host using an internal IP address at 10.0.0[.]114. 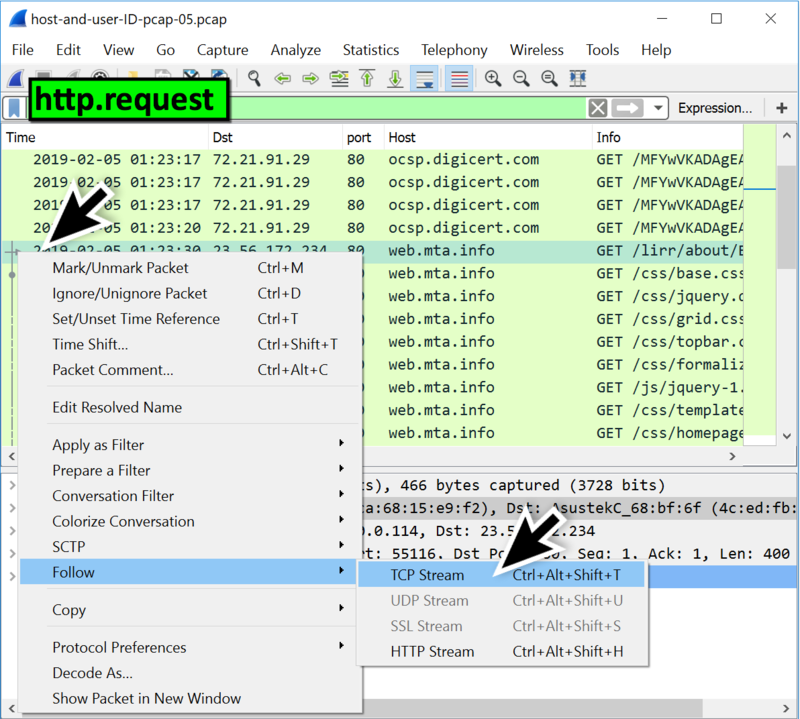 Open the pcap in Wireshark and filter on http.request. Select the frame for the first HTTP request to web.mta[. 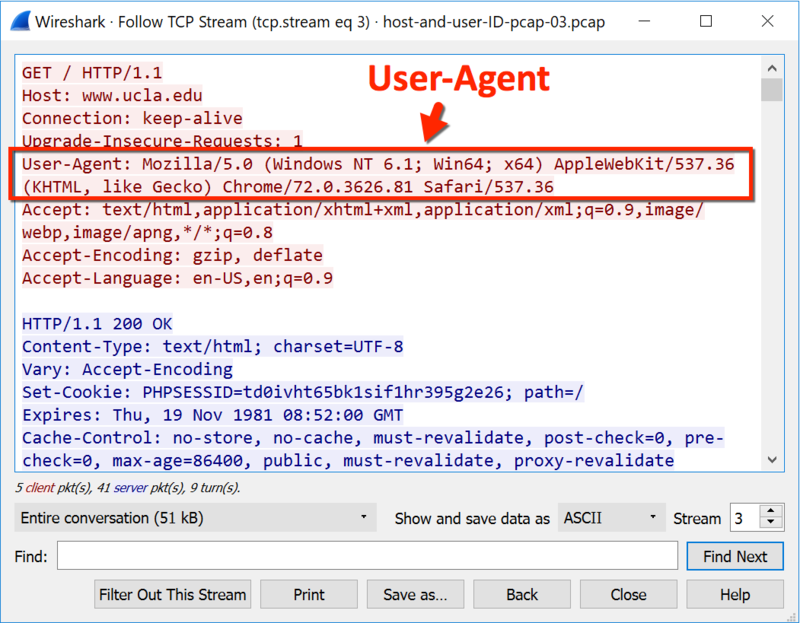 ]info and follow the TCP stream as shown in Figure 11. In Figure 12, the User-Agent line shows (iPhone; CPU iPhone OS 12_1_3 like Mac OS X). This indicates the Apple device is an iPhone, and it is running iOS 12.1.3. A final note about HTTP traffic and User-Agent strings: not all HTTP activity is web browsing traffic. Some HTTP requests will not reveal a browser or operating system. When you search through traffic to identify a host, you might have to try several different HTTP requests before finding web browser traffic. Since more websites are using HTTPS, this method of host identification can be difficult. HTTP headers and content are not visible in HTTPS traffic. However, for those lucky enough to find HTTP web-browsing traffic during their investigation, this method can provide more information about a host. For Windows hosts in an Active Directory (AD) environment, we can find user account names in from Kerberos traffic. 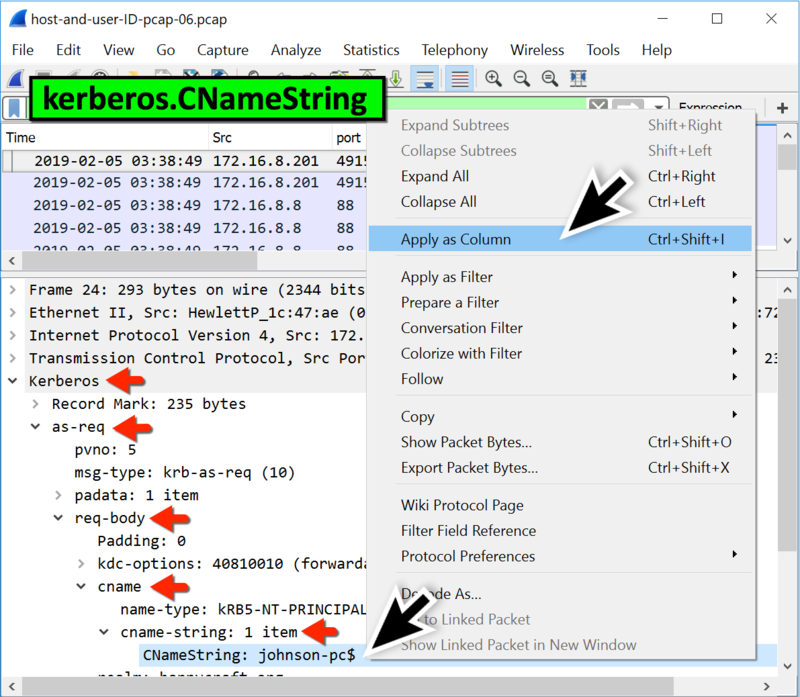 Open the pcap in Wireshark and filter on kerberos.CNameString. Select the first frame. Go to the frame details section and expand lines as shown in Figure 13. Select the line with CNameString: johnson-pc$ and apply it as a column. This should create a new column titled CNameString. Scroll down to the last frames in the column display. 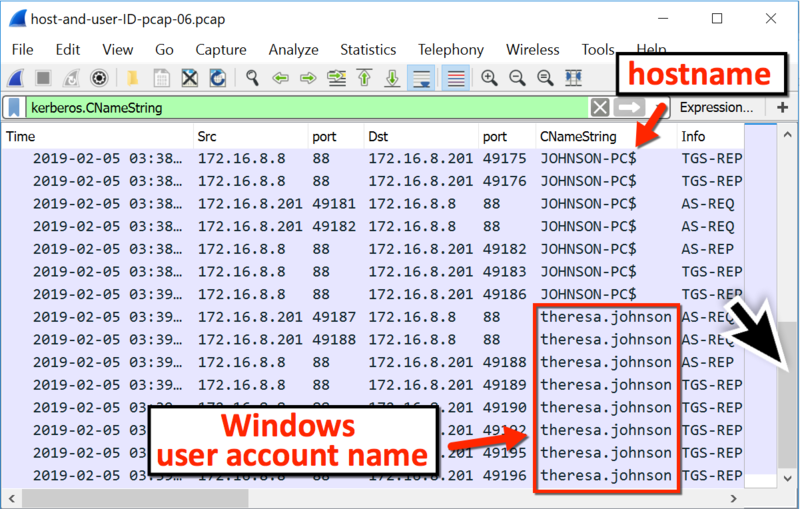 You should find a user account name for theresa.johnson in traffic between the domain controller at 172.16.8[. 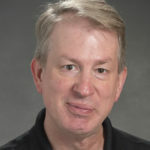 ]8 and the Windows client at 172.16.8[. ]201 as shown in Figure 14. Proper identification of hosts and users from network traffic is essential when reporting malicious activity in your network. Using the methods from this tutorial, we can better utilize Wireshark to help us identify affected hosts and users.